Reality is so much more than we can see. We think we’ve grasped it the more we see of life and how the world works, or how it doesn’t. Movies, music, scientific research, news, etc. all serve to get us on the same page with everyone else. Social knowledge or consensus of what’s real is just that: social knowledge and consensus. Get enough people to agree with you and provide semi-convincing evidence and we’ll believe anything. How is that reality? Everything we think we can hold onto is about as fluid as water. Just a surface glance at our economy reaffirms that even our hard work and money won’t keep us afloat. Tony Hayward, the CEO of BP, said last week, “I want my life back.” Yeah, he used to go on weekend helicopter hops to Vail, CO for skiing and boat trips to the Caribbean; that was his normal life before the oil spill shook his seemingly unshakable existence. We think his lifestyle was unrealistic and extravagant but, to most people around the world, so are we. With our tenuous economy and jobless masses, we’re beginning to feel the security of our lifestyle slipping beneath our feet. What are we without it? This could be depressing if we didn’t understand the Truth. Even people who claim to know the Truth today are acting hopeless because, quite honestly, we don’t get it. Jesus Christ is coming back. This is the way it’s supposed to be before he shows up, remember? Tension is growing in the Middle East, a plague of locusts threatens to wipe out a year’s worth of Egyptian crops, more nuclear missiles are aimed at Tel Aviv than any other city in the world, earthquakes, volcanic eruptions… I mean, c’mon! This is reality. Why do we say we serve Jesus (if we say we serve him)? Is it just because it works for us? Church people, Christian college students, and youth groups -not to mention the rest of the world- all have the same epidemic right now and you can see it in their eyes; it’s stealing our souls. The epidemic is APATHY. We’re so full of ourselves and our desire to sit comfortably entertained on our “tight” budgets that we think we’re sacrificing if we give a little extra in the Sunday offering. But don’t you dare try to move us; our plans are still almighty. We’re in control here. Good stewardship becomes an excuse for our apathy. Forget sacrifice, forget loving until it hurts, forget holding up a high standard of purity, unity, or humility; forget crying because you realize so many people are going to hell. Have you ever cried watching the fighting in the Middle East? How hardened have we gotten to suffering and sacrifice? We don’t believe in anything we’re not feeling at the moment. How is that reality? 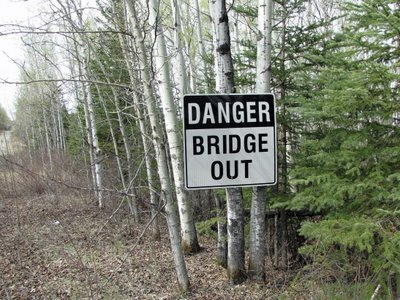 I like to illustrate it like this: If I was standing by the side of the road next to a sign that said “Bridge out ahead,” I wouldn’t let you pass without doing everything in my power to stop you from killing yourself. You might scream out your window at me that I don’t really know what the sign says or that I’m being judgmental of your driving or that you have the right to drive wherever you want. Even still, if I really care about you, I’ll keep trying to get you to turn around. I’ll keep pointing to the sign. This is my only purpose in writing. It’s my purpose in living. Why would I waste my time doing anything else? I won’t coddle you but I would gladly die for you. Sounds crazy and ridiculous but, yeah, I love you that much and yeah, this kind of love is more real and solid than social consensus and comfortably controlled budgets. This entry was posted in Renewed Thinking. Bookmark the permalink. This may sound crazy, but couldn’t you make the argument of whether reality exists at all? I mean if like you said, ‘we don’t believe in anything were feeling at the moment,’ then reality is whatever we want it to be. And you made the point of asking how can this be reality? So unless of course we as humanity have completely misinterpreted the definition of reality, does it exist at all? 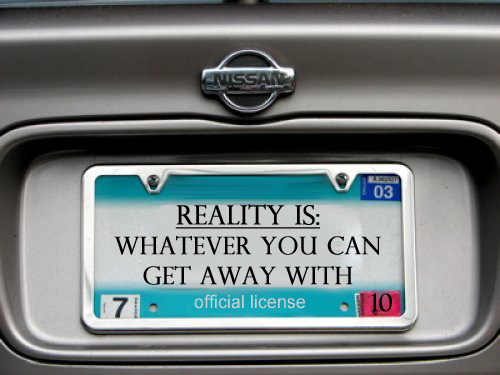 Now of course it exists and of course life’s happenings are ‘real’, but if even those who do understand the truth still don’t get it, then maybe we just aren’t fully capable of dealing with reality. So I guess my question to you refers to your conclusion about love. Of course God’s love is a reality, but is our love as humans, as imperfect and conditional as it is, considered a reality if we’re ‘feeling it or not’? Btw, if you don’t know who this is, my name is Sam and I met you and your mother in Bobby’s Englewood coffee shop a few weeks ago. Do you wanna grab coffee sometime, when you get back to Ohio? That’s the beauty of it! God’s love IS the only concrete reality! This is why the Bible tells us that we have to “die” to ourselves (that natural stuff we were born with) like it talks about in Romans 6. Until we do, according to scripture, it’s true that we aren’t fully capable of dealing with reality. How can limited beings grasp something limitless? Pinocchio is a fabulous illustration of this. The poor guy wanted to be a real boy but he couldn’t figure out how. He eventually became real when he made the ultimate sacrifice; he DIED and suddenly everything he was before he died was transformed. He became just like his loving creator. Minus the blue fairy, it could almost be a sermon. So, I put something together even before I knew your last name… your precious sister, Danielle, and I used to hang out. We even went to camp together! What a small world! I asked her about that and she remembers you too! She’s actually a school teacher in NY right now; she says hi by the way! Hope you’re having fun in Hong Kong!